Last year, with a new baby, I didn’t have a Christmas tree. I was afraid of ornaments breaking, and didn’t want to spend money on buying all new non-breakable ornaments! This year, I really wanted to give my almost-two-year-old a Christmas tree since we missed out last year. So I decided to brainstorm on how to easily make non-breakable ornaments from what I had at home. Which is how the idea struck me to use all of our Disney Tsum Tsums! We have dozens of Tsums, so for a small tree that my toddler can easily decorate, our Tsum collection was perfect to use! I went to Michael’s craft store, and bought clear plastic DIY ornamnets. They open up in the middle, and are meant to put things inside like pictures, etc. to create your own ornament. 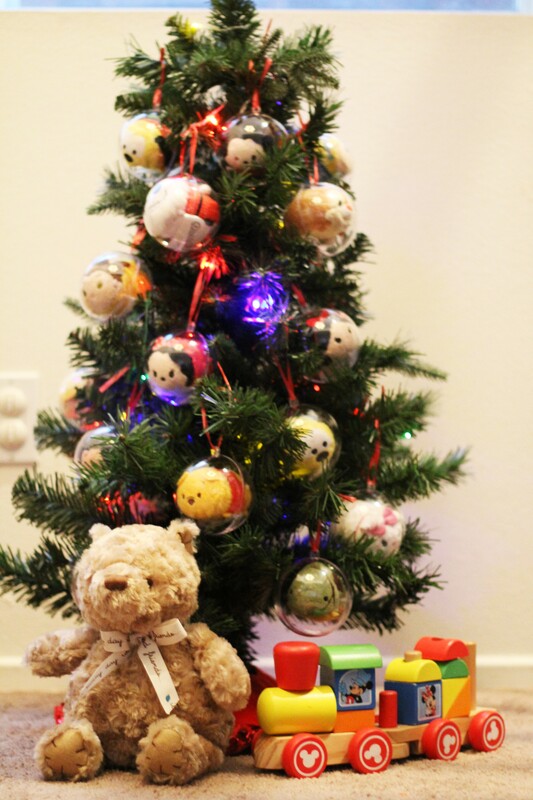 The medium sized ones were perfect Tsum-sized, and once I put the Tsums in I added a ribbon to hang on the tree. The clear plastic ball ornaments were $1.49 each regular price, but with Michael’s frequently having sales, it’s easy to get them at a discount. They also sell Tsums, so you can get some there to fill your ornaments while you’re at it! For me, this was very cost effective since I had lots of Tsum Tsums already. But even if you need to buy the Tsums to make these ornaments, it still comes to about $5.50-$6.50, cheaper than most non-DIY ornaments! What’s great too is that if you don’t glue the ornaments together, it’s not permanent! So you can change out your Tsums each year! My daughter loves hanging up these ornaments, since she recognizes the characters. She also from time to time has fun taking them out, putting them back in again, and hanging them on her tree. My family wishes you all a merry Christmas, happy holidays, and a beautiful Disney Tsum Tsum Christmas tree! Such a creative, adorable idea! Perfect for a Disney toddler-safe tree!